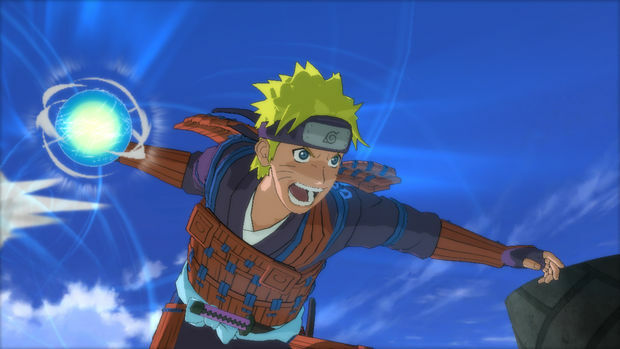 As with its brethren in the Ultimate Ninja Storm series, Naruto Shippuden: Ultimate Ninja Storm 3's approach to depicting super-powered ninja action is best described as a bit "Hollywood," with all pros and cons that such a descriptor might attach. Indeed, like a stereotypical Hollywood adaptation of some geek-favorite franchise, Ultimate Ninja Storm 3 is bigger, glitzier, faster, louder, and more colorful than its manga source, but it's also simpler, shallower, and even a tad sanitized. Nevertheless, it, like its peers, remains a grand spectacle, capturing the best in anime excess and standing tall as one of the few, proud proofs that it is in fact possible to make a triple-A "anime game." As a direct sequel to 2010's Ultimate Ninja Storm 2, Ultimate Ninja Storm 3 retains most of that game's structure while incorporating some of the mechanical refinements introduced in last year's Ultimate Ninja Storm Generations. 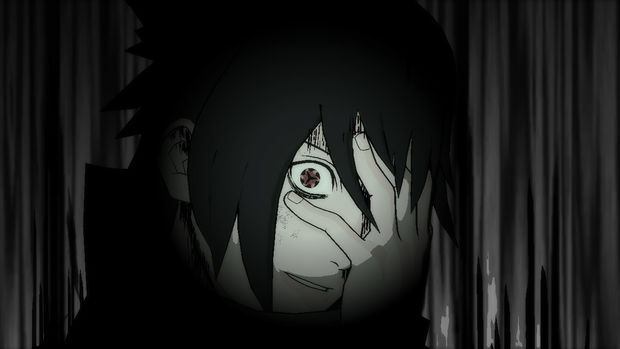 Players can expect to power through a ten-to-twelve hour "Ultimate Adventure" story mode, covering the core plot of Naruto Shippuden following Naruto's battle with Pain (the endpoint of Ultimate Ninja Storm 2), then recounting most of the major events of the Fourth Ninja World War, with brief flashback missions featuring Naruto's parents. If all of that sounds like gibberish to you (or if this is your first time with Naruto), you'll be out of luck hoping everything will be explained to you in Ultimate Ninja Storm 3. That's mostly due to the game's placement in the overall Naruto canon, which is still a long way from over. Imagine starting on the Mass Effect series with Mass Effect 3, and you'll be close to the level of prior knowledge Ultimate Ninja Storm 3 can't help but assume the player possesses. Many of the smaller details and characterizations will fall flat unless you have at least some level of investment in the Naruto universe and its dozens-strong cast. The story ends up somewhat less coherent than in Ultimate Ninja Storm 2. In fact, just to get it where it was the game makes a number of tweaks to the plot, which may annoy fans that want to see every single event portrayed. Further, even a bumping-up of the game's age rating (in Japan it went from the equivalent of an "E" to a "T") doesn't save it from feeling a tad bloodless, which isn't the greatest thing to be when trying to portray how awful global war is for all involved. As a result some of the more shocking moments of the manga have their impact diminished. Narrative foibles aside, though, Naruto is, and remains, a superhero story targeted at teens and tweens. Its messages of friendship, legacy, and brotherhood are universal (and universally cheesy). Provided players have a certain tolerance for that kind of heavy-handed mushy stuff, it's a fun ride and can even be touching at times. 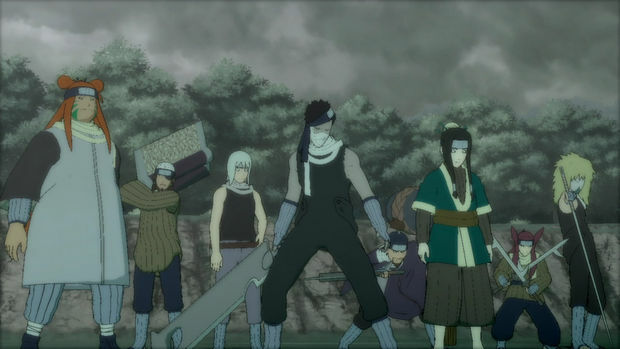 Players will explore the story much in the same manner as they did in Ultimate Ninja Storm 2, walking about static environments such as the Hidden Leaf Village in the fashion of an old-school Japanese RPG, visiting shops, taking on side tasks, buying and collecting items, and viewing cutscenes. Though these JRPG trappings aren't the most refined that genre offers, and in some ways could be interpreted as folderol designed to pad out the game time, it feels like a pleasant diversion in practice, and lends a weight to the narrative that one would never expect a fighting game to possess, let alone an anime-series tie-in. The item collection and shopping serves a secondary purpose, as well, by allowing players to fill out their "Ninja Tools," which function as powerups and sub-weapons during combat. This time around the tools have been split into the "Hero" and "Legend" categories, with "Hero" tools seemingly used for healing and stat boosts, and "Legend" tools for damage-dealing and trap-laying. 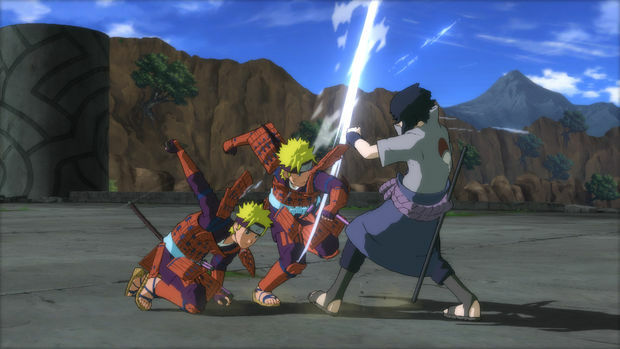 The tools are leveled up by participating in Ultimate Ninja Storm 3's version of a Paragon/Renegade choice, the "Ultimate Decision" system, where during certain events players can pick a "Hero" or "Legend" path affecting which tool type gets improved. In execution the system feels somewhat superfluous. With few exceptions, each choice only really changes the difficulty of a fight ("Legend" usually being tougher), or perhaps the order in which certain events play. But, as is usually the case with this sort of narrative fare, the joy and glory isn't so much in the story itself but the telling, and Cyberconnect2 has pretty much mastered the art of spinning Naruto's type of blockbuster yarn. Barring some cutscene sequences that seem to approach Xenosaga-length around the middle of the game, much of Ultimate Ninja Storm's best storytelling happens right in the thick of battle, when players are most engaged with the actual mechanics of the fighting system. The fighting in Ultimate Ninja Storm 3 is quite simple, and is unlikely to win the franchise a main stage spot at the next EVO Championship. Two characters face off in a 3D arena. One face button throws ranged shuriken, one attacks, one jumps, and one does a "Chakra Load," which modifies the next action press, either unleashing a powerful Ninjutsu attack, throwing supercharged shuriken, or performing a "Chakra Dash" that instantly closes (or opens up) the gap. Double-taps and holds further expand the options, triggering heavier versions of Ninjutsu or a quick-stepping dodge maneuver. There's a button for blocking, and another for the "Substitution Jutsu," which can instantly break an enemy's combo, setting them up for a back attack. 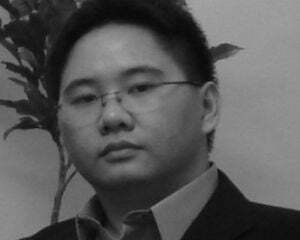 Two buttons are reserved for Support Attacks, calling in selected support characters to defend or attack an opponent. Summoning one's mates often enough charges a Support Gauge that increases their potency and unlocks powerful team attacks. Many characters also have "Awakened" modes, a powered-up state active at low health that locks out some moves but vastly increases damage and speed, and in some cases, changes a character's appearance or moveset -- a trait that manifests quite dramatically for "Jinchuriki," a set of characters (Naruto himself among them) that play host to living weapons of mass destruction. None of the dry technical descriptions above do much justice to what actually happens onscreen, though, as the game is at almost all times a mind-blowing riot of color and over-the-top animation. Manga creator Masashi Kishimoto's colorful and diverse character concepts mesh perfectly with the dynamic, over-the-top style, resulting in something epic happening most any time you push a button. Fighting is a joy to watch both as player and spectator, with characters career about the screen, dashing to and fro and beating the snot out of each other with fireballs lightning strikes, rocks, bombs, balls of energy, clone armies and all manner of other things. After their absence from Ultimate Ninja Storm Generations, the series signature setpiece boss encounters make a return, and have characters facing off against everything from a personal duel against a former friend to a Godzilla-scaled encounters between giant ninja and giant monsters. Cyberconnect2's flair for the audacious (the same one that eventually birthed the likes of Asura's Wrath) is most apparent in these lavishly produced, elaborately choreographed sequences, peppered with Quick-Time Events (here called "Interactive Actions"). Nailing button prompts perfectly gains points during a match, unlocking "Secret Factors" like extra dialog or extended versions of certain scenes, as well. Certain sections also change the pace by introducing "Mob Battles," a mode best likened to Tekken's "Tekken Force" gameplay, where players chop through crowds of fodder enemies. While somewhat awkward due to movement and controls still being tuned for one-on-one combat, they do serve as a pleasant diversion and don't outstay their welcome. A lineup of over 80 characters ensures that while every character has the same basic move set, everyone feels relatively different. Granted, veteran players may find less novelty in the roster. The majority of the roster return from previous games, gaining little more than a tweak in costume or an update to their move set. Only a dozen or so can be genuinely considered new. Despite the simplicity of the input, the system is refined enough to allow for a decent amount of tactical consideration, particularly when fighting other humans rather than the AI. 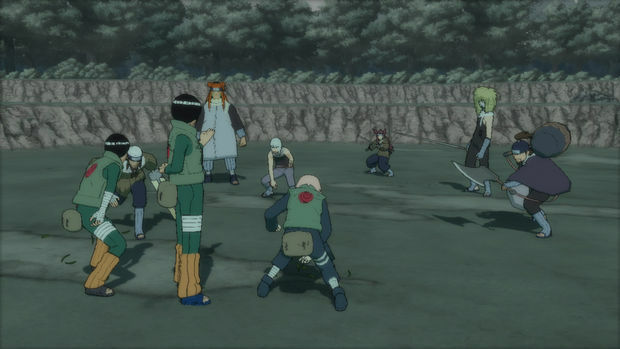 Rather than a contest of knowing specific moves or combo memorization, a pitched Ultimate Ninja Storm 3 bout is more about timing, disruption, and opportunism. 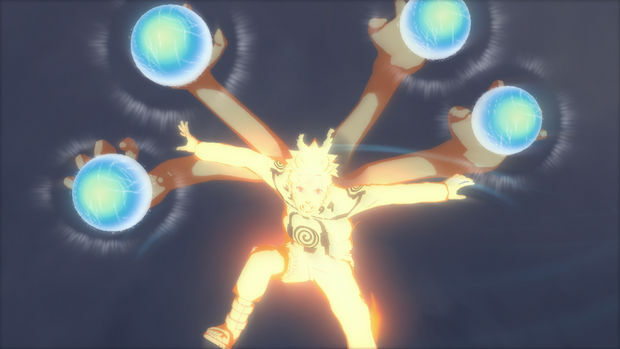 Because Ninjutsu and Ultimate Attacks are easy and quick to deploy, and because the Substitution Jutsu is practically a get-out-of-stun-lock-free button, keeping opponents on the back foot while using support attacks to make sure those highly damaging techniques actually hit, rather than waste Chakra. Unfortunately, with such a large roster balance seems to be a secondary priority. The online matches I've played feature a preponderance of faster characters over the slow "bruisers." Network performance ranged from fair to poor, though this may have been a result of my locality rather than inadequate netcode. There's little compensation in place for laggy players, though, so folks looking for the fairest matches may wish to search closer to home. While the game isn't a genuine sea change from its predecessors, it stays true to the franchise's foundations, and makes up for any lack of innovation with the grand, beautiful spectacle that is its hallmark. The iterative refinements Cyberconnect2 have implemented over the series' history have helped to deepen the gameplay as well, bringing a more satisfying competitive experience while still maintaining accessibility. Though it stumbles somewhat due to unfortunate narrative placement, Naruto Shippuden: Ultimate Ninja Storm 3 is a must-play for any Naruto fan, as well as anyone looking to have a good time wallowing in fun anime ridiculousness.